This month’s RRR hero has a real eye for turning something old and used into something new and beautiful. 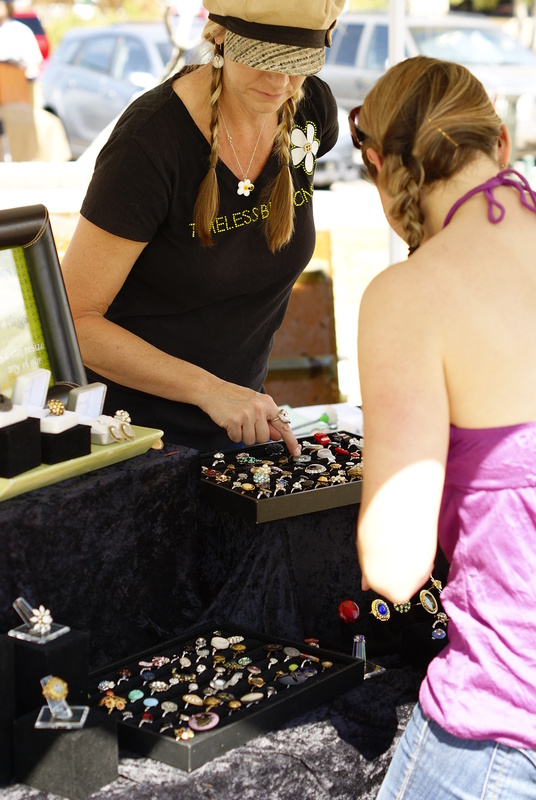 Meet artist Cheri Montgomery and her jewelry business, Timeless Buttons! Originally from Oregon, Cheri has lived in the Town of Gilbert for the past 16 years. Having always had a love of jewelry, Cheri was inspired three years ago to begin making rings from recycled vintage buttons. Collecting buttons from around the world, Cheri learns each button’s history and loves to share the history of each item with her customers. Her collection of buttons dates to as far back as the 1700s, and includes buttons from military uniforms, service groups such as the Boy Scouts, vintage designer buttons from Chanel, as well as glass, enamel, stone, and other materials from countries like the Czech Republic and France. Along with buttons, Cheri also makes rings from vintage brooches and single earrings that have lost their mates. She notes that while brooches are out of style and single earrings go unworn, she can breathe new life into them with a bit of creativity! Cheri says her rings help keep history alive. She tells stories of people that have brought her tins full of vintage buttons that they have kept over the years but had no use for. She has also worked with customers that have brought her buttons that were on a grandparent’s old uniform or dress, and could no longer be used but had great sentimental value. In this way, the family has new items they can wear regularly that keep their loved one’s memory alive. You can find Cheri and her beautiful rings at the Gilbert Art Walk the first and third Saturdays of the month beginning this season on October 5th. Along with vintage buttons, the Art Walk is near and dear to Cheri’s heart. She began participating three years ago and last year took over ownership and management of the event. She continues to work hard to connect small business artisans and the Gilbert community through the Art Walk, and loves that she has found such a niche for her and the other artists’ work here in Gilbert. Additionally, you can connect with Cheri through her website http://www.timelessbuttons.net/ or the Art Walk website http://www.gilbertartwalk.com/index.html. Cheri’s passion for the personal histories in her buttons and her ability to create beautiful treasures from these old and no longer used items are what make her Gilbert’s Reduce Reuse and Recycle hero for the month of September. If you know someone who you feel should be recognized for as an RRR Hero, please e-mail us at recycle@gilbertaz.gov or give us a call directly at 480-503-6459.